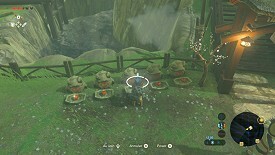 As told by the first Korok you meet, these seeds are to be given to Hestu, another woodland fairy, located not far from Kakariko Village in a first time. In exchange for these, Hestu can expand your pouch thus allowing you to carry more weapons, bows and shields. 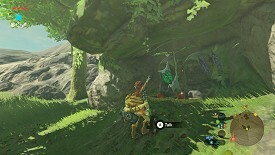 The number of seeds required to expand each type of pouch is on the Upgrades page, as well as Hestu's other locations. On the map, you can locate more or less easily ALL the stone circles to be completed, and the three lined up trees, so look closely at your map. The leaf on tree stumps shows the direction towards which the yellow circle will appear. The missing stones to complete the circles can more or less always be found in the direction of the missing space. For ex. if the missing space is to the south, go look southwards. Heaps of leaves can be hit with a sword, burned or blown up with a bomb. After you've met the old man, below on the right, run to the headland and jump into the water in the centre of the water lilies. [After you've left the Great Plateau] At the Shrine of Resurrection, where you woke up, look at the sparkles. 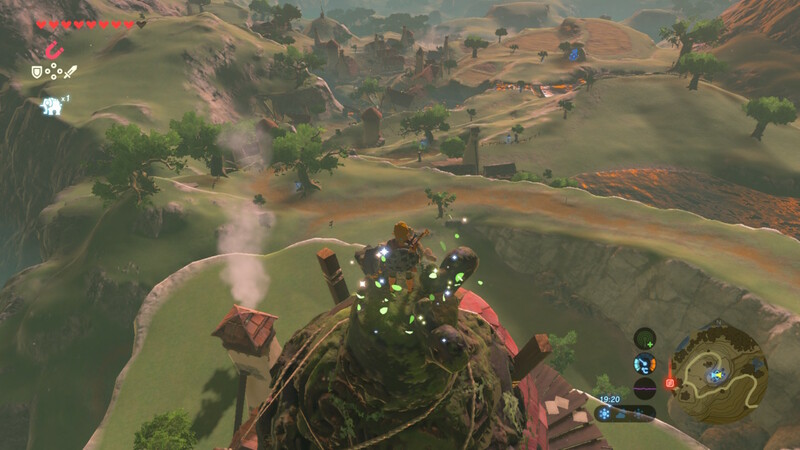 Atop the Temple of Time, climb on the spire, then look at the sparkles. In the southeastern part, climb on the roof of the woodcutter's house and look at the sparkles. In the northeastern part of the Plateau, where there are a few lakes and ponds, look for a hollow tree trunk with a boulder and a chain. 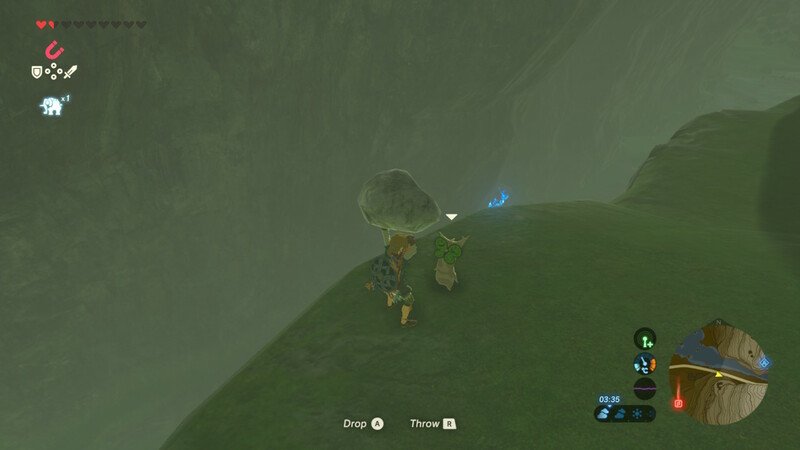 Use Magnesis on the boulder in the mud and place it in the hollow of the trunk. 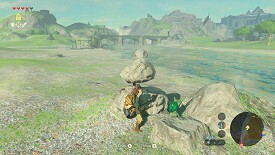 Northeast of the Forest of Spirits, next to a pond are two rocks leaning on each other. Lift the stone under them. 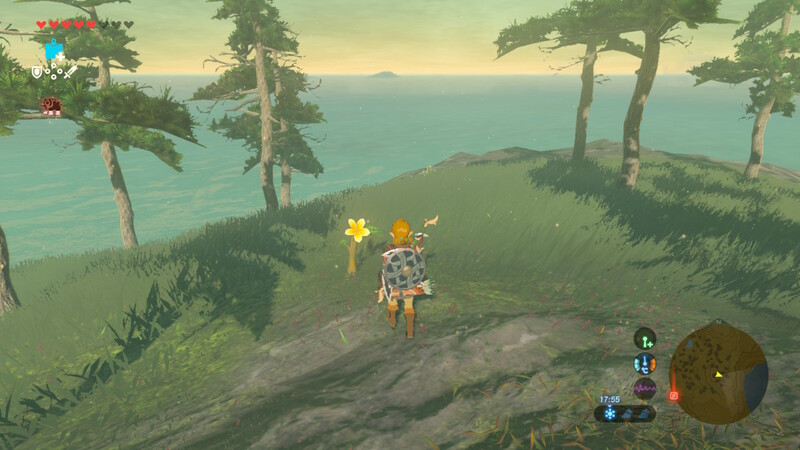 In the Forest of Spirits, get in a huge hollow tree trunk and walk on all the vanishing yellow flowers to make a Korok appear. In the Forest of Spirits, east of the huge hollow trunk and north of a pond, look for a trunk with stilt roots, hit the bunch of leaves, then lift the stone. In the Forest of Spirits, southeast of the huge hollow trunk, in a small clearing, climb atop a kind of pillar made of rocks, then lift the stone. 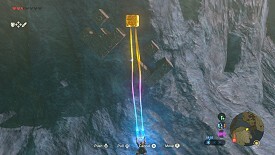 In the northwestern part of this region, southwest of the Forest of Spirits, on high grounds, climb on an even higher platform, lift the cube and place it on another cube. In the western part of the region, under the broken bridge, there are some sparkles. From the bridge, use the Cryonis Rune to lift the log which will fall next to the bridge, then jump on this log and look at the sparkles. 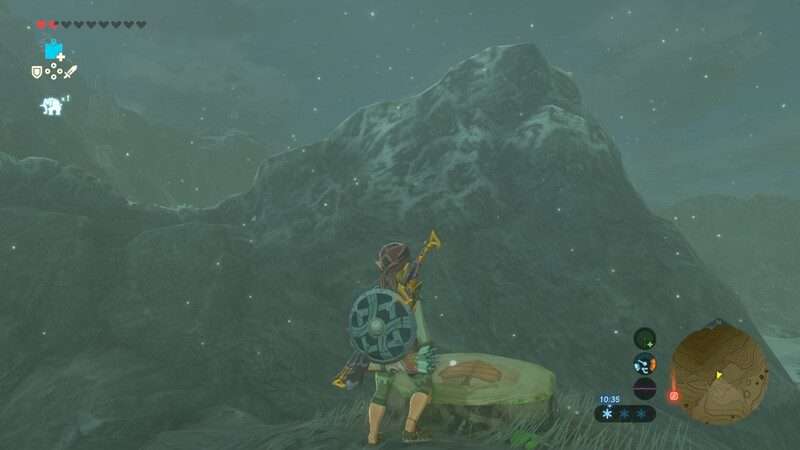 All the way to the northwest of Mount Hylia, climb on the bulwarks, go all the way to the north, shoot 4 Fire Arrows on the big ice cube and look at the sparkles. From the above location, keep walking along the bulwarks to the south. Between the last and second to last little "roof", go down carefully along the wall until you reach a snow-free zone. Grab the cube with Magnesis, then go north and place it on the cubes on the other side of the wall. 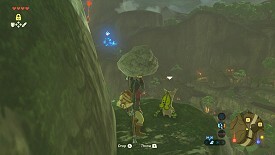 In the southwestern part of Mount Hylia, look for a circle of rocks a bit on high grounds. Go get a stone and place it where one is missing. 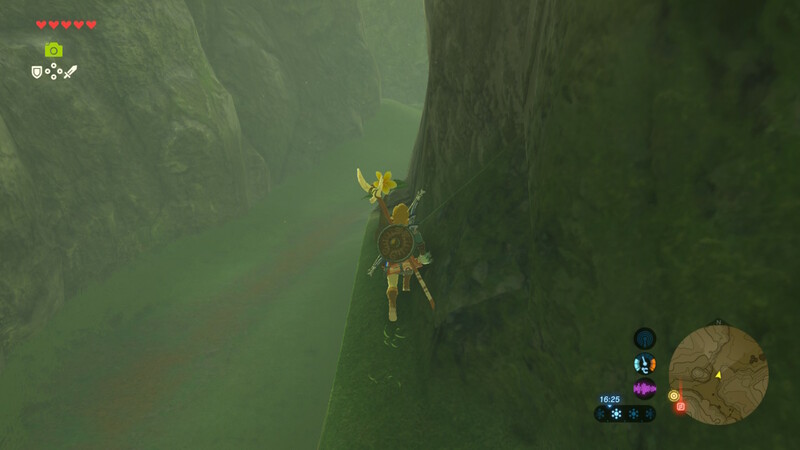 In Mount Hylia, all the way to the south of the map, where the walls are starting to appear, go south of these walls and lift a stone. From the above location, keep going along the walls and locate a stone under a big metal plate. Use the Stasis Rune on this plate, hit it twice with a hammer, then lift the stone. East of the Ja Baij Shrine, in the bulwarks, notice a big metal plate. 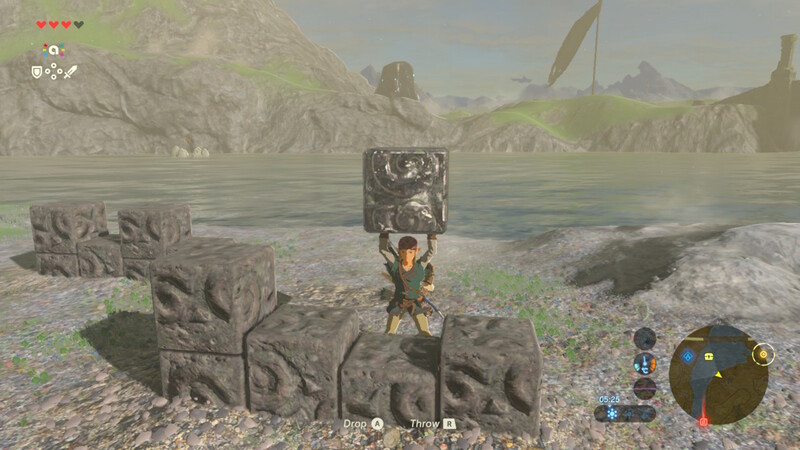 Use the Stasis Rune on this plate, hit it twice with a hammer, then lift the stone. 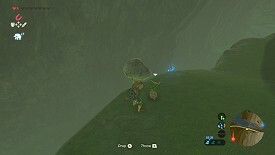 From the seed next to the Ja Baij Shrine, jump with the Paraglider until you reach the ground to find another Korok under a plate that you have to freeze with Stasis (a bit more to the south). Southwest of Proxim Bridge, on the west banks of Hylia River, lift a stone and throw it into the circle of stones in the water. Right before you reach Proxim Bridge, climb at the top of the mast with a flag and look at the sparkles. Under Proxim Bridge in the middle, lift the stone. South of Proxim Bridge, on the east bank, lift the stone. From the above location, more to the south, are two groups of cubes. Lift the glowing cube and place it on the other group in order to form two identical groups. On the west bank of the river, a bit more to the south from the above location, notice a rolling rock. Push it down the slope into a hole. In the western part of this region, atop Scout's Hill, lift the stone in the centre of the ruins. From the above location, fly west, cross the path and enter a cave. There are five groups of yellow flowers, with 1 to 5 flowers per group. Step on the flowers following the order 1, 2, 3, 4 and 5. 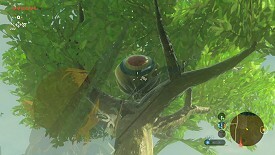 From the top of Scout's Hill, on the other side of Hylia River stands a big tree on a hill, and at the bottom, two small statues. Go behind the statues and look at the sparkles. In the western part of the Hills of Baumer, get close to the pinwheel on a hill, then shoot arrows at the three moving targets. Southeast of the Hills of Baumer, there are three apple trees on a hill. Pick the apples or make them fall in such a way that the three trees look the same. From the above location, keep going towards a lake to the southeast, then go south and notice a metal plate. 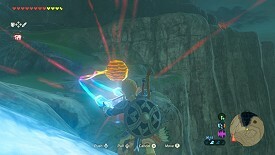 Use Stasis on this plate, hit it twice with a hammer, then lift the stone. On the path leading to the Dueling Peaks (after Proxim Bridge), south of the path, you'll spot a big hollow tree trunk. Get in and step on the five vanishing yellow flowers. On the path leading to the Dueling Peaks, further to the north of the path, you see a rolling rock next to a hole. Push the rock into the hole. Even more to the north of the path, there is a huge rock with a cracked part. 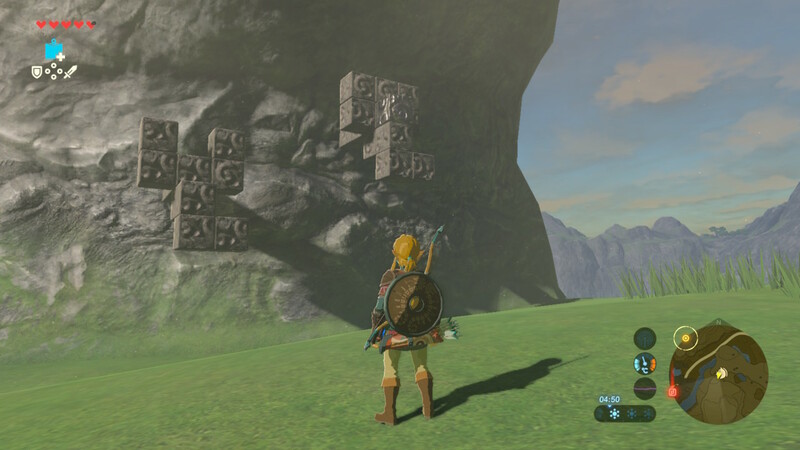 Blow up this part, then enter the cave and lift the stone. At this place there are also rocks with some Amber, Rock Salt and other ores. On the path leading to the Dueling Peaks, south of the path, you spot a pinwheel on higher grounds. Stand next to this pinwheel, then shoot at the three moving targets. A bit before the path going between the Dueling Peaks, on the south bank of the river, right next to the water, look for a yellow flower, then touch the four following ones while crossing the river. At the beginning of the path going between the Dueling Peaks, on the southern side, there is a "path" above the water level, and another one even higher. Get on this path and lift the stone (north of the trees kinda arranged like a "ç"). Atop the Dueling Peaks, south bank side, there are two statues with one of them having an empty bowl at its feet. Place an apple into this bowl. Atop the Dueling Peaks, north bank side, lift the lonely stone. From the above location, go west and look for three huge rocks. From there notice two trees to the east, then push a rock so it rolls down between these two trees. Northwest of Batrea Lake, to the west and next to the path, climb a big tree and lift the stone. Southwest of the forest surrounding Batrea Lake, use Stasis on the big rock next to the river, hit it twice (with a hammer for example) then lift the stone. South of the forest surrounding Batrea Lake, climb on the stump next to the pinwheel, then shoot some arrows at the two acorns flying above the trees to the north. Southeast of the forest surrounding Batrea Lake, climb at the top of the hill, then push the rock rolling to the east into a hole. East of Batrea Lake, at the outskirts of the forest, look for a boulder linked to a chain. Grab it and place it into the stump next to it. Under Eagus Bridge, notice a broken cart on a small islet. Lift the stone located on this cart. At Nabi Lake, in its southern part, swim towards the stone into the water, then lift the stone. Northwest of South Nabi Lake, near some small ruins, there are three small fences in a line. 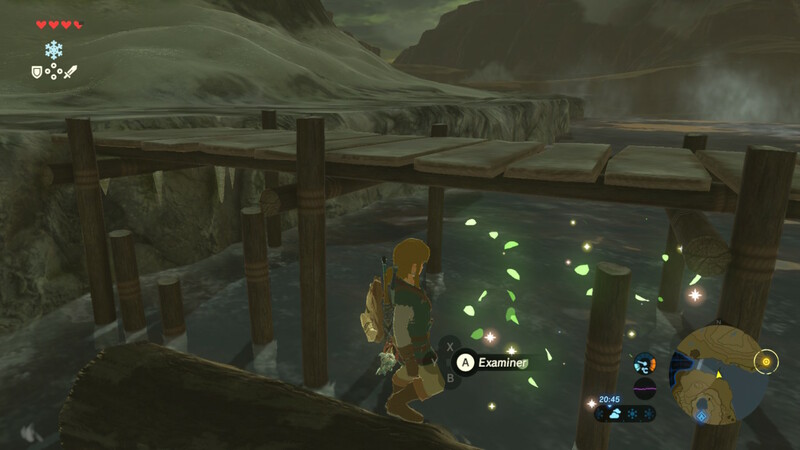 While riding your horse, cross these three fences to make a Korok appear. At South Nabi Lake, swim to the islet in the water, then lift the stone. West of South Nabi Lake, climb at the top of the flag mast and look at the sparkles. At Owlan Bridge, in the middle of the bridge, notice a hanging acorn under the bridge. Shoot an arrow at it. On Kakariko Bridge, look west, there is a circle of stones into the water. 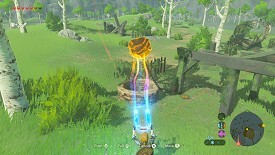 Use Cryonis to create an ice pillar in front of the circle, then throw a rock on the pillar which will bounce off and fall into the circle! Climb up the Dueling Peaks Stable along the tent and the poles, then look at the sparkles at the tip of the horse head. In the southwestern part of Hickaly Woods, lift the stone inside a hollow tree trunk. South of Hickaly Woods, climb on the huge rock in front of the waterfall and lift the stone. In the middle of Bubinga Forest, stand next to the pinwheel, then shoot arrows at the three moving targets. In the western part of Bubinga Forest, climb on the huge tree and lift the rock. South of Little Twin Bridge, at the limit with the Faron region, when the river makes a turn, look above and notice a kind of small ledge along the cliff. Climb the wall to reach that place or go down from above and go down until the ledge where you can lift the stone. Southwest of Mount Rozudo is a small hot water spring. Jump into the circle of water lilies. In the southern part of Mount Rozudo's forest, climb next to the pinwheel, then shoot some arrows at the two acorns flying above the trees. At Oakle's Navel north of Mount Rozudo, climb the cliff to the east and jump into the circle of water lilies. 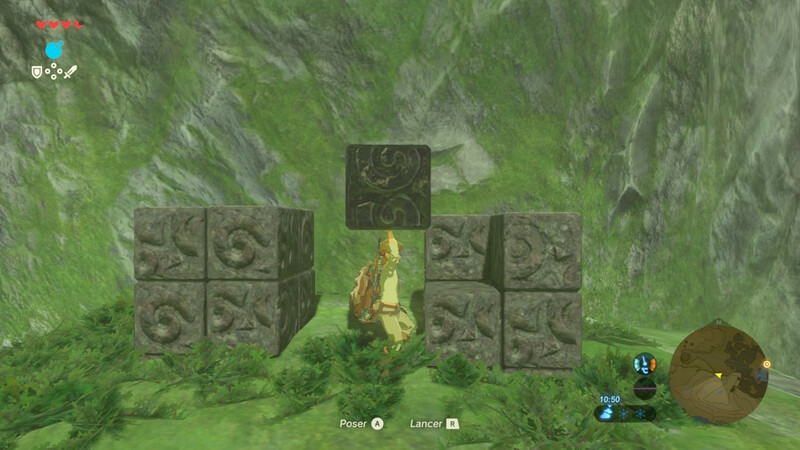 Before you reach the village (from the east), look at the left wall, use Magnesis to grab the lonely cube and place it on the other three to form a square. A bit before the eastern entrance of the village, climb the wall above a puddle, then lift the stone. At the eastern entrance of the village, look at the target above with some arrows next to it, and shoot an arrow at this target. At the southern entrance of the village, look at the target above with some arrows next to it, and shoot an arrow at this target. From the above location, take a few steps towards the village, right before the little red flags, climb the wall to your left. Before you reach the top, lift the stone. Next to Impa's house, there are some apples as an offering. Place an apple into the empty basket. 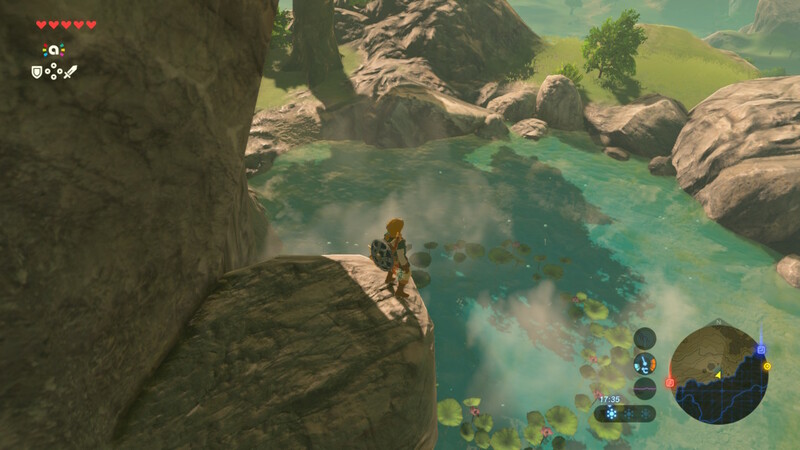 North of Impa's house, dive into the circle of water lilies. From the Fairy Fountain, go northeast and look at the right wall above. 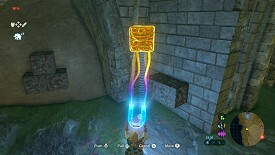 Use the Magnesis Rune to grab the shiny cube and place it into the other structure, into the hole to the right. East of Kakariko, at Pierre Plateau, climb the highest peak and lift the stone at the summit. Zoom as much as you can on your map and notice three trees next to each other. Look at the apples on these trees and pick them or make them fall so that the three trees look the same. From the above location climb at the top of the eastern hill and lift the stone. From the above location climb at the top of the second eastern hill and lift the stone. In the northern part of Mable Ridge, climb the huge tree and lift the stone. Beware of the Guardians! At Lake Siela, on the northwestern side, go down on a headland, then notice the circle of water lilies into the water. Have a nice dive! At Lake Siela, from the south highlands, glide towards the rock in the middle of the lake, then throw a stone into the circle of stones. All the way to the northeast of Lake Siela, on high grounds, at the level of the tree group on the northern bank next to the waterfall, climb the highest fir tree and look at the sparkles. 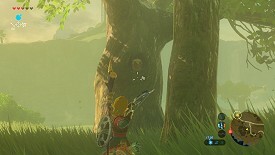 At Fort Hateno, around the path, get close to the pinwheel and shoot at the two acorns going over the trees to the southeast. 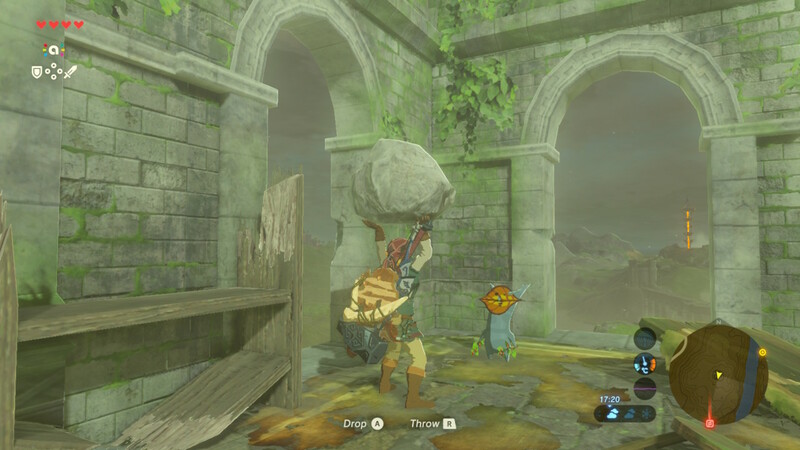 Right after you've passed by Fort Hateno, go all the way to the north, move a metal door, then lift the stone beneath it. West of Robred Dropoff, east of Lake Siela and south of the waterfall, notice three rocks atop a track. Make one fall down into the hole below. From the above location, go south towards the two trees and climb. Blow up the pile of rocks and lift the remaining stone. 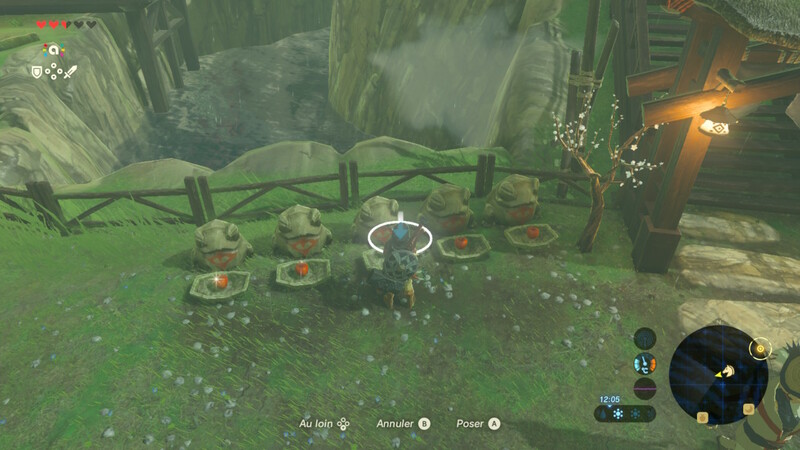 In the western part of Robred Dropoff, south of the Kam Urog Shrine, place an apple into the empty basket. 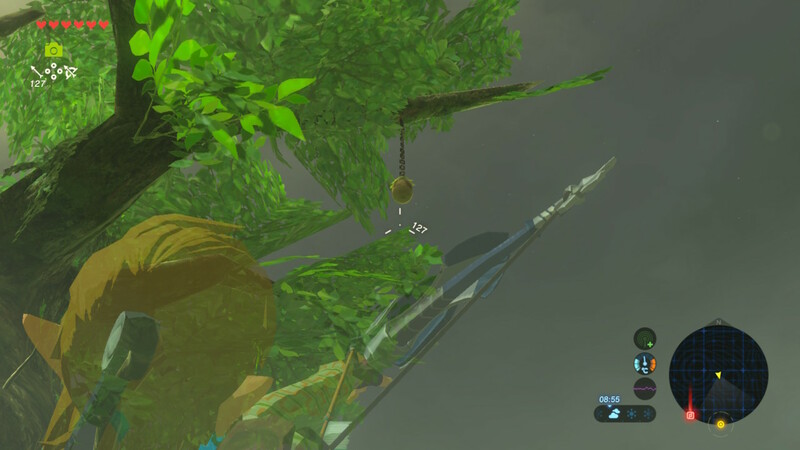 In the western part of the Cliffs of Quince, there are two groups of hanging cubes. Use Magnesis to grab the shiny cube and place it on the other group so the two look the same. Southeast of Hateno Tower and northwest of Lake Jarrah there is a group of trees on high grounds. There, some ruins make a sort of square shape. Move the door with Stasis, then lift the stone beneath. West of Camphor Pond, at the Equestrian Riding Course, ride your horse on the circling track, shoot at the 10 wooden targets along the track, then shoot an arrow at the balloon that appeared atop the house to the southwest. 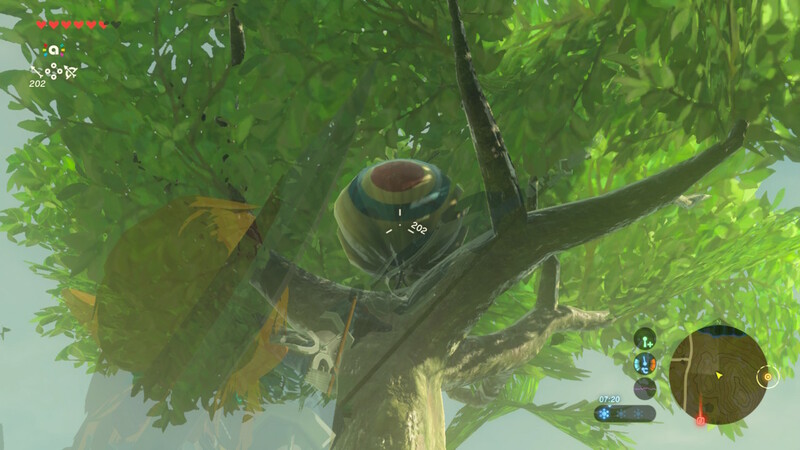 In Marblod Plain (south of the tower), in the northeastern part of the forest, there is an acorn in the hollow of a tree trunk. Shoot an arrow at it. At Firly Plateau (southeast of the tower), climb the hill with a dug passage in the middle and three apple trees at the top. Pick the apples or make them fall so the three trees look the same. On the southeastern bank of Lake Jarrah, lift the stone. In the northwestern part of Ebon Mountain, to the east of the path to Firly Plateau, use Magnesis to grab the small cube and place it in such a way that the two cubes groups look the same. In the southeastern part of Midla Woods (west of Hateno Village), east of the path, shoot an arrow at the acorn in the hollow of a tree trunk. At Camphor Pond (northeast of the tower), jump into the circle of water lilies. In the northwestern part of Ovli Plain, in the northwestern part of the forest, shoot an arrow at the acorn in the hollow of a tree trunk. Southwest of Nirvata Lake, climb the hill, get close to the pinwheel, then shoot some arrows at the six moving targets. In the middle of Nirvata Lake, there is a circle of water lilies. Glide and jump into it from the cliffs. In the northern part of Nirvata Lake, there is another circle of water lilies. Glide and jump into it from the cliffs. 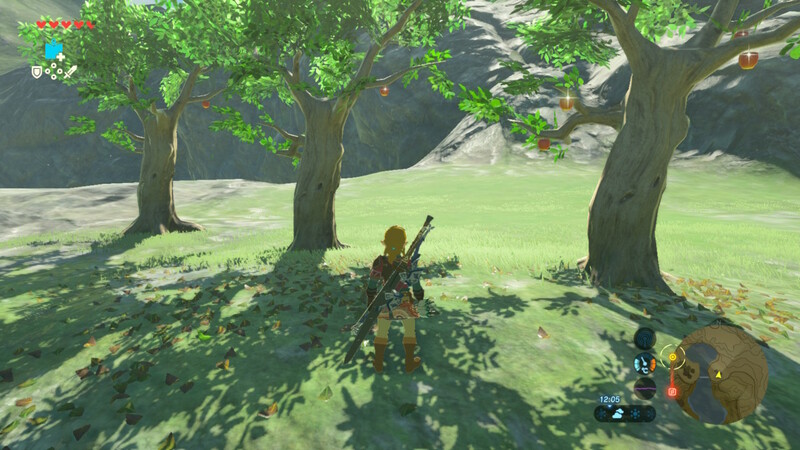 East of Nirvata Lake, three apple trees are standing on a hill. Pick the apples or make them fall so the three trees look the same. On Nirvata Plateau, northeast of Nirvata Lake, there are two groups of cubes. Use Magnesis to grab the highest cube and place it on the other group to create two identical structures. All the way at the top of the Peak of Awakening, lift the stone. In the southern part of the village, all the way to the east of a small pond, lift the stone. 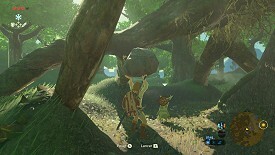 North of the village and north of Zelkoa Pond, climb on the huge tree and lift the stone. East of the Lab, go to the small pond and jump into the circle of water lilies. 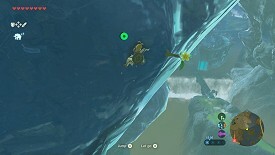 South of the Myahm Agana Shrine, climb towards Ebon Mountain to the south to find a yellow flower, then follow the next 9 flowers to find a Korok on Ebon Mountain. 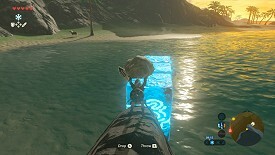 On Tenoko Island, all the way to the southeast of the area, stand on the trunk with a leaf, then quickly (during the yellow dots timer), take the Korok Leaf on the ground, get on the raft and sail to the islet to make the Korok appear. On the west coast, to the south and on high grounds, there is a circle of stones. Go get a stone to the west and place it in the empty space. South of Ebon Mountain and south of the path leading to the sea, there are three apple trees on a hill on high grounds. Pick the apples or make them fall so the three trees look the same. South of Loshlo Harbor, there is a circle of stones on high grounds. Go get a stone to the southwest and place it in the empty space. At Kitano Bay, towards the middle, there is a circle of stones into the water. 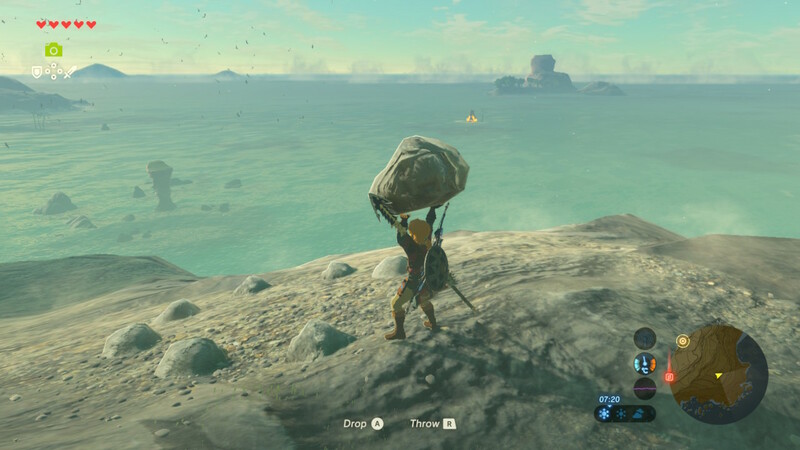 Generate two or three ice pillars into the water towards this circle, then go get a stone on the beach, throw it on the pillars, then pick it up and throw it into the circle. 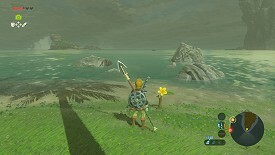 On the land between Deepback Bay and Hateno Bay, on the beach, look for a yellow flower. 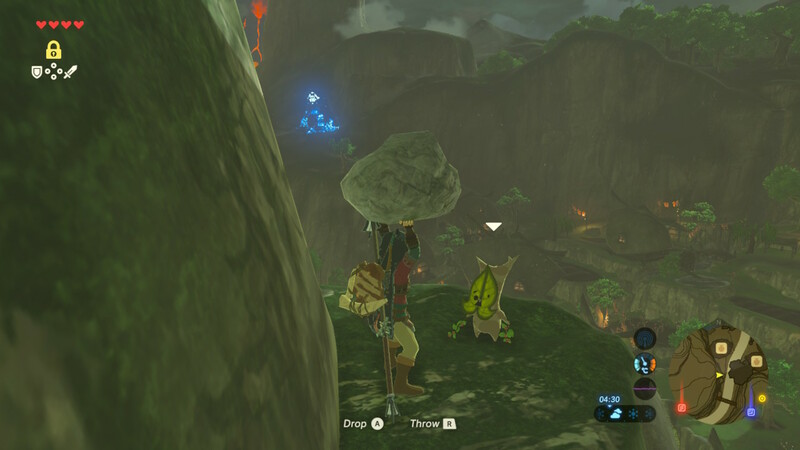 Follow the four others and the Korok will appear. At Deepback Bay, south of the mountain and north of this beach, notice two statues with a coconut in front of one of them. Place a coconut in front of the other. At Mapla Point, in the north part of the lake, jump into the circle of vegetals. At Mapla Point, south of the lake, there is a circle of stones. Go get three stones in the vicinity and place them in the empty spaces. At Mapla Point, southeast of the lake, look for a yellow flower, then touch the four following flowers while going up towards northeast. North of Mapla Point, atop a hill, stand next to the pinwheel, then shoot some arrows at the three moving targets. 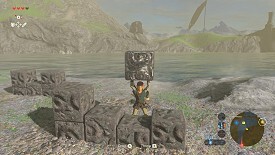 On Afromsia Coast, in its southern part, use Stasis on the metal plate, hit it twice (with a hammer for example) then lift the stone. 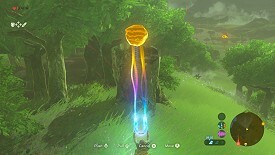 On the road between Kakariko and Lanayru, before Rabia Plain, look for a yellow flower on high grounds (on the eastern side of the road), then touch the four following flowers. 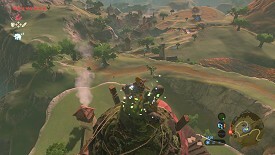 East of Quatta's Shelf, atop a peak located west of "Lanayru Road - West Gate", place an apple in the little statue's basket. In the centre of Quatta's Shelf, there are three trees side by side. Look at the apples on these trees and pick them or make them fall so the trees look the same. 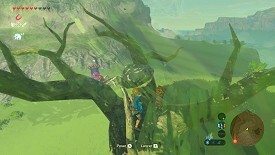 In the western part of Quatta's Shelf, there is a lonely tree. Climb at the top and lift the stone. In the northwestern part of Rabia Plain, north of the great lake, climb the tree and lift the stone. 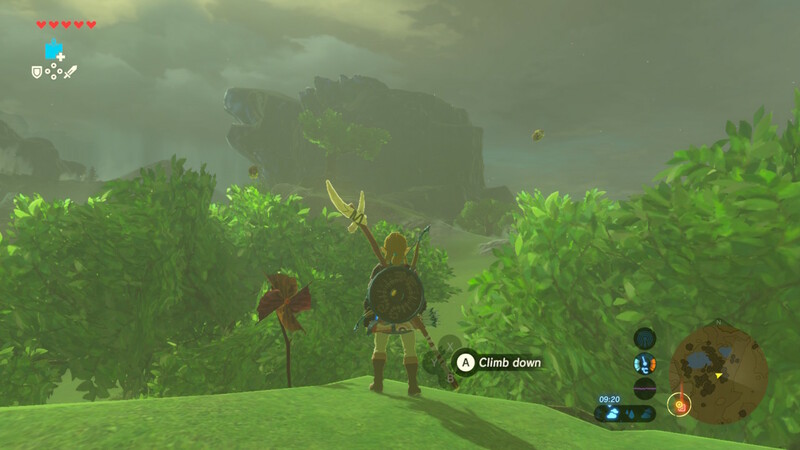 In the northwestern part of Rabia Plain, in a small forest, get close to the pinwheel on a hill, then shoot some arrows at the two flying acorns. In the northern part of Rabia Plain, atop a very high tree on high grounds (next to Kass), lift the stone. From the above location, fly east until you reach the river (Rutala River), notice a balloon above the water and shoot an arrow at it. In the centre of Rabia Plain, in the small lake, follow the sparkles and look at them. In the eastern part of Rabia Plain, in a small forest, climb atop the highest fir tree and look at the sparkles. On an islet in the middle of the Promenade, lift the stone. From the above location, a bit to the west, climb the walls, then jump into the circle of water lilies. At the Phalian Highlands, southwest of the Promenade, go get a stone behind a bush and place it into the circle of stones in the empty space. At Lanayru Plateau, in its western part, there is a huge rock atop of a hill. Make it roll down into a corridor to the west so it falls into a hole. In the centre of Lanayru Plateau, on a huge flat area, around ten rolling rocks stand forming a circle and another one is in the middle. Push this rock into the empty space. 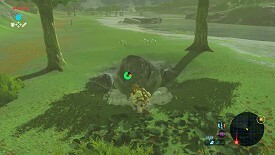 North of Mount Lanayru, there is a circle of stones next to the water. Go get a stone a bit to the west and go place it into the empty space. Northwest of Mount Lanayru, there is a circle of stones in the lagoon between Trotter's Downfall and Mount Lanayru. Go get a stone a bit to the west and place it into the empty space. West of the Tahno O'ah Shrine, stand on the stump with a leaf, then go down until you reach the yellow circle by using both the shield surfing and the Paraglider. 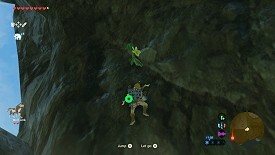 In the southwestern part of Walnot Mountain (south of Lanayru Range) (on the same "row" as Retsam Forest), look for a yellow flower atop of a hill. 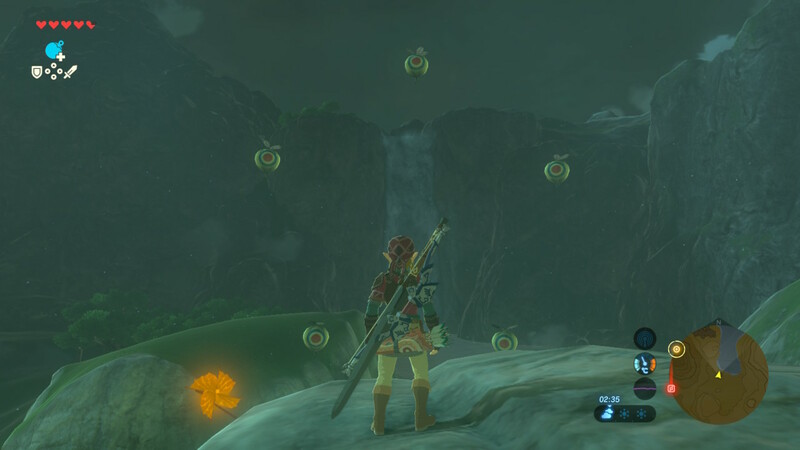 Follow the 9 following ones to the east and the Korok appears. 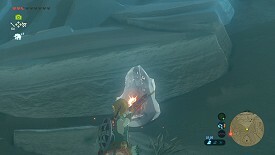 Climb all the way to the top of Mount Lanayru (above the Spring of Wisdom), then go down to the northwest and notice a shiny ice block. Thaw it thanks to four Fire Arrows, then look at the sparkles. From the above location, keep going north-northwest towards a peak (look at the map). Another shiny ice block is guarded by a Lizalfos. Thaw it, then look at the sparkles. 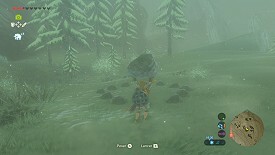 In the northeastern part of Mount Lanayru, look for a circle of stones inside a forest, find a stone to the southeast and place it into the empty space. West of the Tahno O'ah Shrine, stand on the stump with a leaf looking at its tip, make a few steps on the left, take out your surf-shield, then go down while making a large turn on the left to the yellow circle within the time limit. East of Mount Lanayru, not far from the bank, roughly between the Tahno O'ah and Jitan Sa'mi Shrines, push one of the three rolling rocks into the hole to the east. South of Mount Lanayru (northwest of the text "Lanayru Range" if you zoom as much as you can), thaw the ice block, then look at the sparkles. In the eastern part of Naydra Snowfield, notice the moving sparkles and look at them. 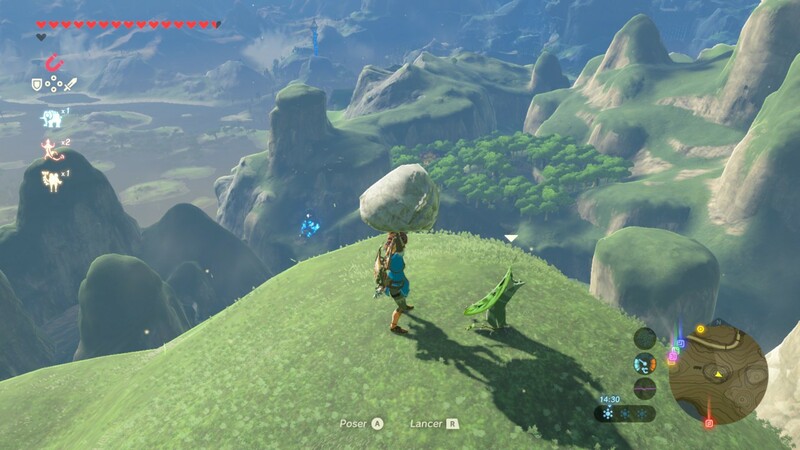 North of Naydra Snowfield, climb the mountain, go behind a peak and look for a stump with a leaf. Get on it, fly to the yellow circle at the top of the peak and touch it before the end of the time limit. West of Telta Lake, inside a cave under the rocks, there are two small statues. Place an apple in the empty basket. South of the wetlands, in the Rikoka Hills, look at the sparkles next to the ruins and a pond. In the southwestern part of the wetlands, in the biggest island of the Millennio Sandbar, look at the sparkles on the water. In the southwestern part of the wetlands, a small island hosts three apple trees. Pick the apples or make them fall so the three trees look the same. Southwest of the wetlands, next to a huge tree located next to a crossroads, freeze the huge rock with Stasis, then lift the stone. In the centre of the wetlands, on Linebeck Island, shoot an arrow at the acorn hanging from a big tree. In the northwestern part of the wetlands, on Zauz Island, use Magnesis to lift the boulder and place it into the well. In the northern part of the wetlands, notice the sparkles moving on the water and look at them. In the eastern part of the wetlands, on Kincean Island southeast of the Hinox, climb the hill, go get a stone to the southwest and place it into the empty space of the circle of stones. In the forest south of the Wetlands Stable, there is a rock at the top of a small heap surrounded by brambles. Jump from a tree or put the brambles on fire, then lift the stone. Northwest of Crenel Peak located northwest of the wetlands, notice a lonely tree. Shoot an arrow at the balloon stuck into the tree. Southwest of Crenel Peak, in a group of trees with a pond, notice a circle of stones around a fir tree and place the nearby stone in the empty space. South of Crenel Peak, in a small group of trees, notice a circle of stones around a tree and place the nearby stone in the empty space. Southeast of Crenel Peak, in some ruins southwest of the Moor Garrison Ruins, there are four groups of stones shared between two ruins. 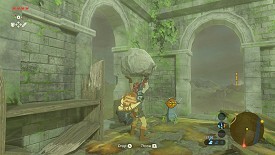 Lift the "spare" stone in the northern ruin and place it where a stone is missing in the southern ruin. Northwest of Zelo Pond, climb on the hill and the big tree, get on the stump with a leaf, then jump down and surf on your shield to the yellow circle within the time limit. Northwest of Zelo Pond, is a pond. Look at the sparkles. Northwest of the forest located northwest of Inogo Bridge, climb the hill, then get on the stump with a leaf. Then, run, fly and run some more to reach the yellow circle under the time limit. Northeast of Inogo Bridge, climb the big hill, climb the lonely fir tree to the top and look at the sparkles. From the above location, keep climbing to the northeast practically to the top of the mountain where there are many trees. On the level right before the summit, against the rocks, there are two groups of cubes. Grab the shiny block and place it on the left group so the two groups look the same. Southeast of Ralis Pond, look for a yellow flower on high grounds, then touch the 9 following flowers while being careful not to fall. In the northern part of Upland Zorana, climb to the top of the hill and lift the stone. Northeast of Toto Lake, notice the moving sparkles and look at them. 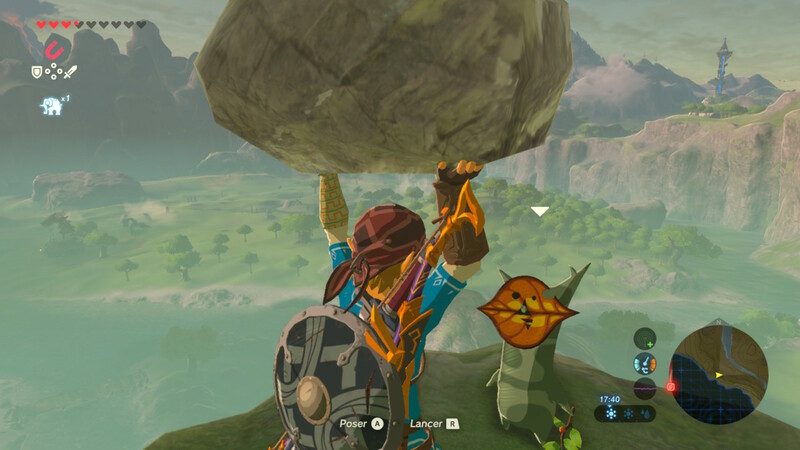 North-northeast of Ploymus Mountain, blow up the pile of rocks, then lift the remaining stone. At Zora's Domain, climb the huge fish statue until you reach the top (top of the dorsal fin) and look at the sparkles. At Zora's Domain, climb the huge fish statue until you reach the top of its head and look at the sparkles on the "flower". From the above location, you can hover down to the front of its head. 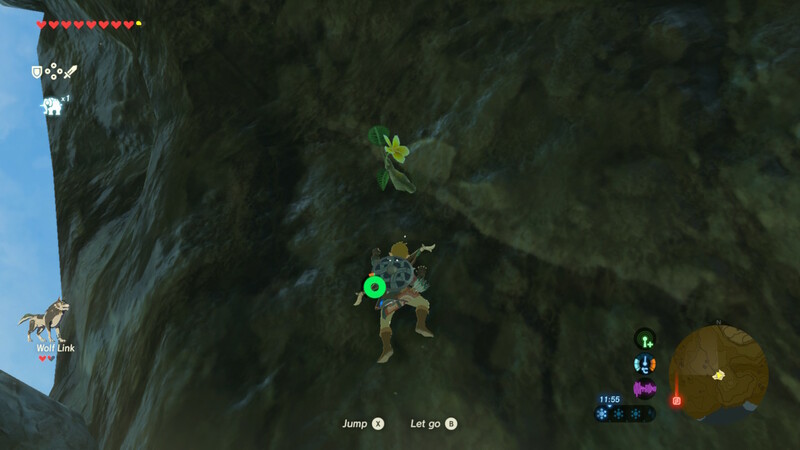 When you see a chest, look for the flower in front of the head and land on it. At the East Reservoir Lake, on the west side, there are two groups of cubes on higher grounds. Use Magnesis to grab the shiny cube and place it on the other group so the two look the same. At Ruto Precipice, at the top of the eastern peak, lift the stone. In the western part of Ruto Precipice, on the ledge on higher grounds that faces the island in the middle of Ruto Lake, lift the stone. 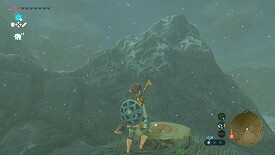 Northeast of Ruto Mountain, where the path makes a sharp turn, climb a hill and lift the stone (not completly at the top). North of Ruto Mountain, in a pond with some water lilies, look at the sparkles. 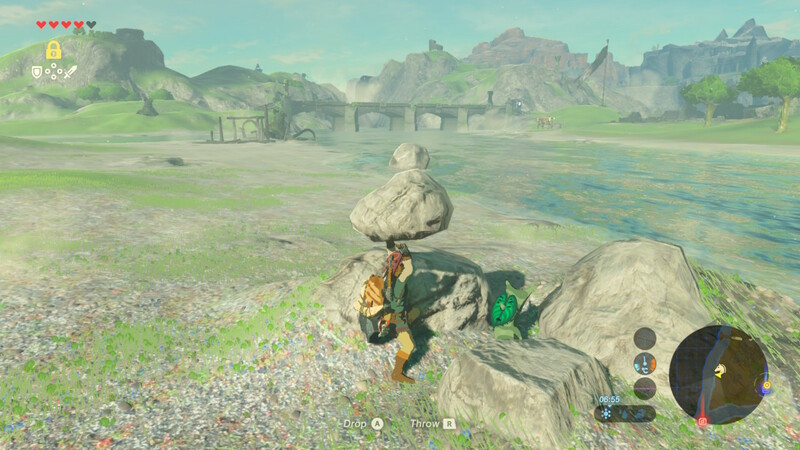 On the small island north of Luto's Crossing, pick up the stone at the top and place it in the circle of stones' empty space. Southwest of the zone where Ruta is once calmed down, there are two groups of cubes against the wall. Use Magnesis to grab the cube on the ground and place it on the left group so the two look the same. Southeast of the zone where Ruta is once calmed down, in a small flat place, look at the moving sparkles. Southwest of the Bank of Wishes, in a pond on higher grounds, throw a stone into the circle of stones in the water. North of the Bank of Wishes, next to a group of trees, use Magnesis to lift the boulder and place it into the well. In the northwestern part of Tabahl Woods, climb on a hill without any trees and lift the stone. At Tal Tal Peak, look for a yellow flower and touch the four following ones. Northwest of Tal Tal Peak, stand above the waterfall, grab the black rock, move it to the other side, then push it into the hole. South of Tal Tal Peak and southeast of the Reservoir lake, there are two groups of cubes. Grab the shiny cube and place it on the same group so the two look the same. 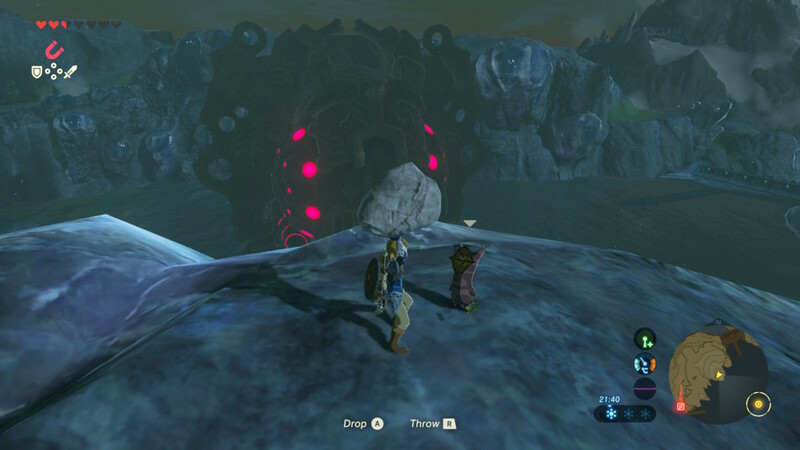 From the above location, go east until the limit with Akkala, go down the cliff, blow up the cracked rocks and lift the remaining stone. East of Ja'Abu Ridge (on the same "row" as the text "Ja'Abu Ridge") and north of the first seed of the "Lanayru Sea" list, blow up the huge pile of rocks, then lift the remaining stone. In the southern part of the Samasa Plain, next to the water, there is a circle of stones. Pick up a stone more to the west and place it in the empty space. In the eastern part of the Samasa Plain, next to a small group of trees, hit the bunch of leaves with your sword, then lift the stone. In the eastern part of the Samasa Plain, inside a tunnel, notice a yellow flower on the eastern side, then follow the four others while going through the tunnel. Between the Samasa Plain and the Brynna Plain, on the bank of Lanayru Bay, blow up the cracked rocks and lift the stone. Between the Samasa Plain and the Brynna Plain, on an islet next to the bank, lift the lonely stone. In the north-northwest part of Brynna Plain, on a headland on higher grounds, look at the moving sparkles. Northwest of the Horon Lagoon, next to the tall cliffs, there are two groups of cubes. Use Magnesis to grab the shiny cube and place it on the higher group so the two look the same. 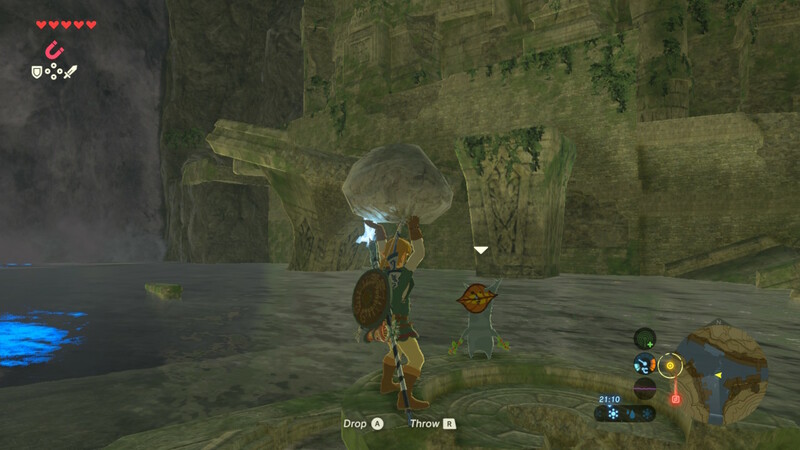 In Horon Lagoon, climb the huge rock structure and look for a circle of stones into the water. 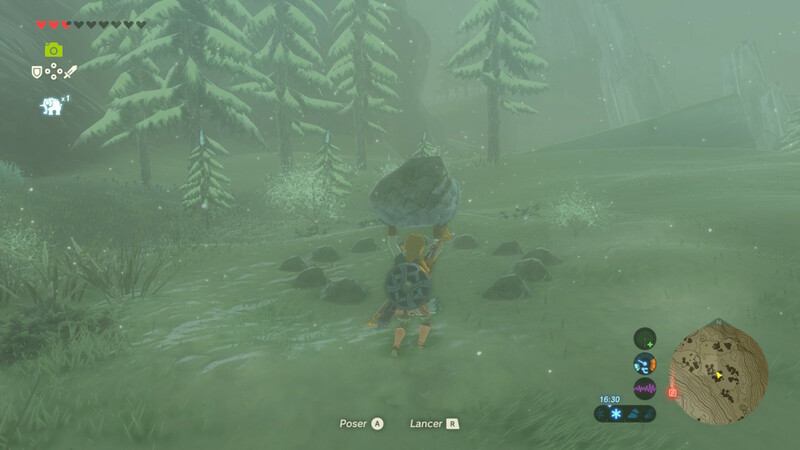 Lift a nearby stone and throw it into the middle of the circle. 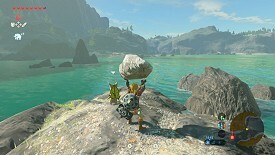 North of Horon Lagoon, on higher grounds, notice a huge cracked rock at the bottom of the cliff, then blow it up and lift the remaining stone. South of the Talus Plateau, in the tunnel south of the Hinox, shoot an arrow at the target. In the eastern part of Lodrum Headland, look for a yellow flower, then touch the four following ones. In the western part of Lodrum Headland, halfway up between the beach and the headland, look for a metal plate. 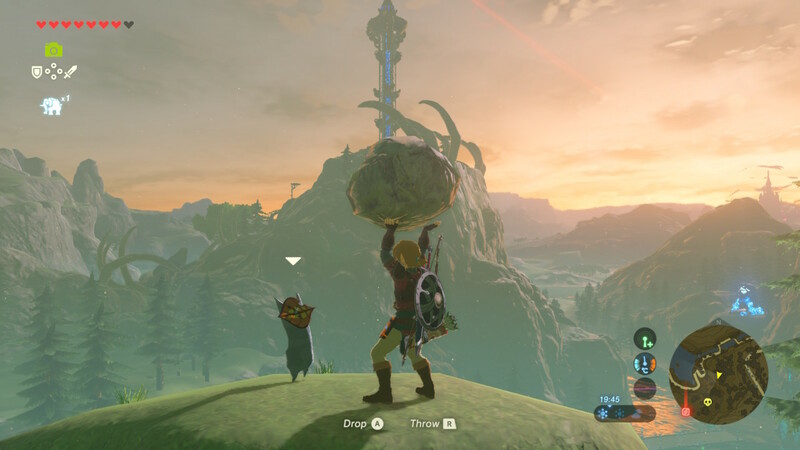 Use Stasis, hit it, then lift the stone. On Wintre Island, notice the yellow flower upon arriving and follow the four following ones. 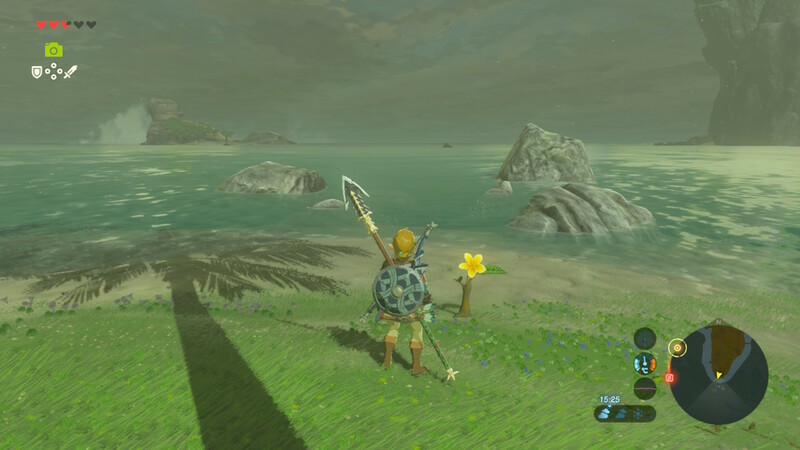 On Wintre Island, next to the first flower, pick up the stone and place it a bit further in the circle of stones' empty place.